When I was working on the later chapters of Tibet: A History I started to explore the archives of India Office Library, where I found thousands of documents from British officials stationed in India, China, and occasionally Tibet itself, mostly from the first half of the 20th century. This is fascinating material, much of it still untapped, though those excellent historians of modern Tibet, Melvyn Goldstein and Tsering Shakya have made good use of it in their books. One event from Tibet’s recent history that I would like to have said more about in my own book is the expulsion of all Chinese officials from Tibet in 1949. This dramatic move was made by the Tibetan government when they realised that the Chinese Communists were about to defeat the Nationalists and become the ruling power in China. At this point the Tibetans had come to a grudging acceptance of some diplomatic ties with the Nationalists, thawing the 13th Dalai Lama’s total freeze-out of China. But the Tibetan government was deeply mistrustful of the Communists, with their anti-religious idealogy. 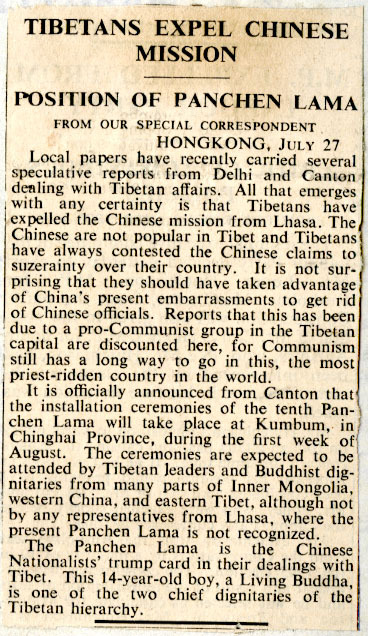 So it was probably the idea that Communist officials would simply step in and take the place of the Nationalists in Tibet that prompted this mass expulsion.This effectively returned Tibet to the way things had been under the 13th Dalai Lama, when China had no official presence in Tibet at all. It was a drastic move and a strong reassertion of the declaration of independence that the Dalai Lama had made in 1913. So, what do the India Office archives tell us about it? Reading through the file titled “Effect on Tibet of Communist Seizure of Power in China” plunges you back into history, watching a situation unfold. I found it genuinely gripping to read the original reports and telegrams of British officials as they receive information, then try to make sense of it and react to it. He told me that what had really happened in Tibet was that the Tibetan authorities wished to get rid of the Chinese Government Mission quickly in order to avoid the risk of a future Chinese Communist Government appointing a Chinese Communist Mission or alternatively of the present Mission transferring its allegiance to the Chinese Communists. The Tibetans had therefore asked the Government of India whether they would receive the Mission on its expulsion from Tibet. Fishing for red herring on a high plateau is too naive an act and politically very unwise. The Chinese ambassador concludes by reminding his British counterpart that “Tibet is and always has been a part of China” (an interesting comment for anyone who wonders if Tibet would have retained its independence had the Communists not been victorious in 1949). The following week is taken up with the British trying to organize a passage for the expelled Chinese (who are still en-route to India). They are to be sent to Hong Kong, and from there to Canton. Tibetan authorities expelled Han people and Kuomintag personnel in Tibet at the instigation of the British and Americans, and their stooge the Indian Nehru Government. A few days later the PLA is in Xining, according to a clipping from The Daily Worker (13th September) under the headline MONKS HAIL PEOPLE’S FORCES. Perhaps this journalist was not fully briefed on the Communist propaganda, for he writes that “Chinghai was formerly part of Tibet.” Anyway, in a matter of weeks the deported Chinese officials and their families were forgotten. As I leaf through the last documents in the file, I see the British now turning their attention to the urgent question of how to engage diplomatically with the victorious Chinese Communists and their stated aim of “liberating” Tibet. I suppose the deportees were left to make their own way home from Canton. If you look at the list, you can see how many of them came from Sichuan and Qinghai (that’s Kham and Amdo in Tibetan terms), meaning a long overland journey back across war-torn China. Even if it’s hardly the most pressing issue of that chaotic time, I can’t help wondering how many of them made it back home. 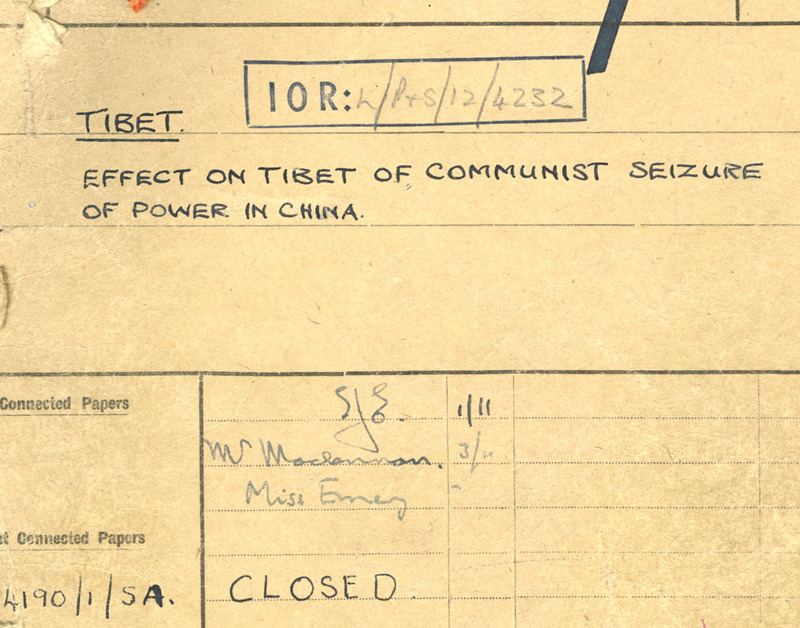 The India Office Records file I have used here is L/P&S/12/4243: “Effect on Tibet of Communist Seizure of Power in China”. 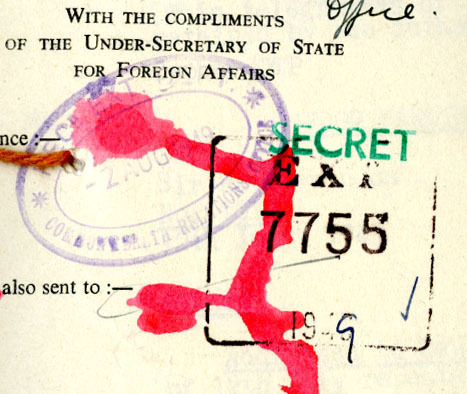 Documents therein run from February to December 1949. Melvyn Goldstein writes about this episode briefly in A History of Modern Tibet, Volume I: 1913-1951 (pp.613-614). His account is based mainly on interviews. Interestingly, one of Goldstein’s sources says that the idea of the expulsion of the Chinese came from Ngapo, who later signed the agreement through which Tibet became part of China, and joined the Communist Party. Another of his sources states that the idea came from the British resident Hugh Richardson, but this was denied by Richardson himself (and the India Office files show that, if Richardson did make the suggestion, it was not with the knowledge of his masters). Tsering Shakya writes in more detail about the episode in The Dragon in the Land of Snows (pp.5-11). His account is based on a wider range of sources, both oral and written. An authoritative source denies Ngapo’s involvement in the matter at all. Shakya also consulted the British Foreign Office documents held at the Public Record Office. I have not seen these, but I presume there is some overlap with the India Office Records. Goldstein say that, “Another 300 to 400 individuals, mostly Chinese, who had been identified by Namseling as spies were photographed and expelled at the same time as the officials.” This is from his source Sambo (Rimshi), but these people were definitely not deported through India. They are probably the same group as those “Tibetans from the eastern part of the country” mentioned by Shakya (p.9). Thus they were probably sent eastward to China rather than via India. This entry was posted in China and Tibet, India Office Records, Recent History by Sam van Schaik. Bookmark the permalink. I am not sure how much Tibet-related material submitted by British officials in Tibet remains ‘untapped’ in the India Office. Apart from my own book largely based on that material (Tibet and the British Raj: the frontier cadre 1904-1947; Curzon Press 1997) plus another which used a lot of the medical reports (Their Footprints Remain: Biomedical Beginnings Across the Indo-Tibetan Frontier, Amsterdam University Press, 2007) plus various articles in academic journals, Alastair Lamb (Tibet, China & India 1914-1950: A History of Imperial Diplomacy, Roxford Books 1989 and British India and Tibet 1766-1910, Routledge 1986 and The McMahon LIne, 2 vols, 1966) has gone through the material very closely indeed and others such as Parshotam Mehra, AJK Singh (whose book Himlayan Triangle was published by the India Office in 1988 and was entirely based on this material) and Premen Addy have also written books using these sources. But good to see research from the rather neglected 1947-50 period. Incidentally, there is considerable overlap between the material in the PRO and the India Office material, but the PRO files continue after the British have left, so there are files there on the 1950s – but when I was last working there quite a number of them were still classified, and it would be worth seeing if that material is now free to be consulted. As for the Chinese who were expelled; Hugh Richardson told me that most of them remained in India, many in Calcutta, but a number of them didn’t leave the Himalayas, and settled in Kalimpong or Darjeeling – and I had my shoes mended by one of them in Kalimpong back in the early 1980s! As for Mrs King and her mother – I don’t have the sources to hand and it might be a co-incidence – but I wonder if there is a connection to the wife/widow of Louis M King, the China Consular official in Tachienlu 1913-16 and 1919-22 – his wife Rinchen Lhamo wrote the book ‘We Tibetans’. Thanks for pointing out these sources, which I certainly should have mentioned here, as I consulted many of them and was expecially grateful for your book, Alastair Lamb’s volumes and Parshotam Mehra’s monograph while researching my book! I guess I was guilty of hyperbole when I said “untapped” but I do think that this material ought to be better known. I enjoyed a talk given by Emma Martin (Liverpool Museum/University of London) at the IATS conference in 2010 on the gift exchange between the Dalai Lama and George V in which she looked at the objects sent from Tibet (now in the BM and V&A) and the British miscronstrual of the significance and intent of these gifts. It would be great to spend some time with the records of the PRO and FO in the National Archives. Tsering Shakya used some FO records in his history, as I remember, on the visit of the Dalai Lama to India in 1956-7. Hi it’s not Louis kings tibetan wife, she sadly died after they returned to the uk in the twenties. I’ve also begun looking through the earlier files of the L/P&S series at the BL, and I’m hoping to start working through them properly and in more depth very soon. There is a lot of overlap with the FO files, as Alex says, but there are also some things missing in one series which appear in the other and vice versa – therefore it really is best to look at both sets. 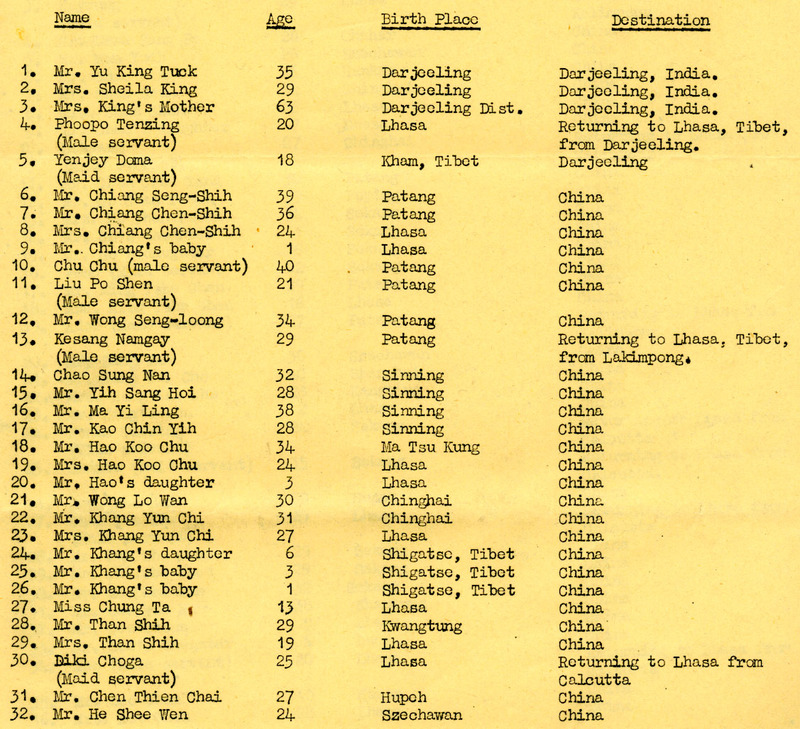 I’ve also looked into Louis King’s genealogy in quite some depth (my brother-in-law is Louis and Rinchen’s grandson). As far as I can tell there’s no connection between him and the Sheila King you found. However, there was another King working in the China Consular service (Frank H. King, if my memory serves correctly – best to check P.D. Coates ‘The China Consuls’ which has a complete list), who was no relation to Louis. I’ve not come across anything (documentary or said within the family) to suggest that the Kings had any connections with India – they were all very much rooted in China (both Louis’s parents and grandparents having been in the Chinese Customs Service and Missionaires respectively). Incidentally, one of the last ‘official duties’ Louis was suggested (but not appointed) for was to accompany the previous Panchen Lama back to Tibet from Peking. This was shortly before Louis and Rinchen finally left China for the UK in 1925. Rinchen died in 1929, and Louis died in 1949, on the day of his 63rd birthday, in fact. This is a fascinating post though – I’m very much interested in colonial interracial relationships at this time. Ann Laura Stoler has done some very interesting work on this topic. It would be fascinating to know more about Sheila King and her Chinese husband. I think it was quite unusual for Western women to make such marriages, much more common for Western men to do so – although both scenarios were generally perceived as being quite taboo. Thanks for the clarification about the various people with the surname King. Perhaps you’ll come across some more clues in your further work on the archives. Thanks too for the link to your article, which is great and full of details I was not aware of (like the animus between Bell and King). Nice photographs too.